We finally faced the ugly truth: my neck issue that leads me to wake up with migraines is probably exacerbated by our crummy mattress. Once you know what your spinal problems are, you become hyper aware of your positioning. So after seeing a chiropractor for spinal care, I knew the mattress we were sleeping on was about as supportive as Gilligan's hammock. I have since realized that the cheaper and firmer the mattress, the better. It does make sense when you consider that we were made to sleep on the ground, and I can't think of anything more supportive. This means I would have felt better and saved money if I'd slept on an inexpensive, firm futon that cost $100 and replaced it every two years instead of struggling for three on a more expensive pillow top name brand. No wonder I always sleep great on our old, second hand, pop-up camper mattress. My chiropractor said lots of people have reported sleeping better in their campers and that dense latex foam might be the way to go. So, I looked up Tempur Pedic, Ikea mattresses, Natura, and other latex types; however, it's a little scary to invest a lot in something that may prove wrong for me in a couple of months. 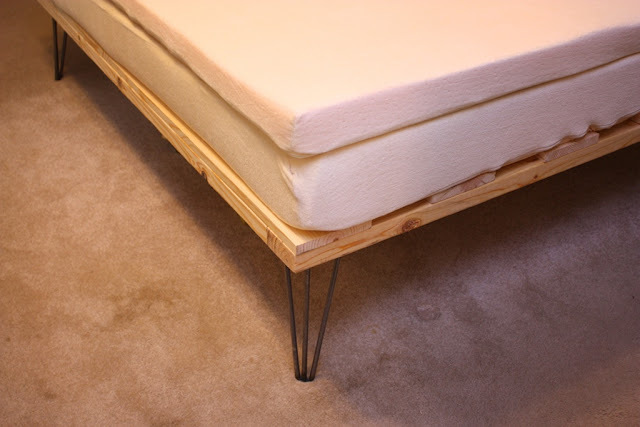 After reading more reviews, about construction and a few "how-to" sites, I settled on The Foam Factory's most dense all natural latex mattress with a 3" 5lb. ViscoMax memory foam topper mattress. 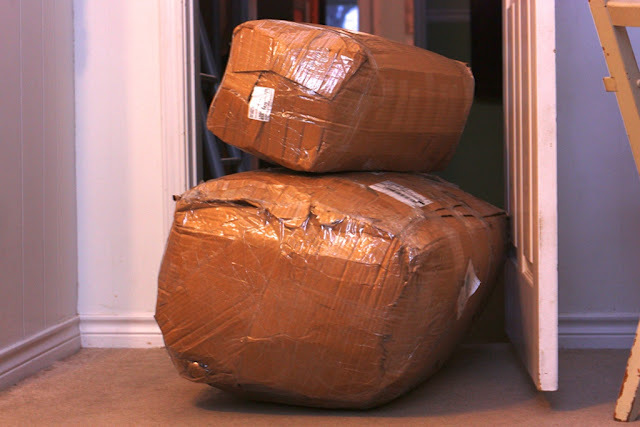 The mattresses were delivered in two small but crazy heavy boxes. We sort of rolled them through the house into the bedroom and began to remove the packaging so they could unfurl. Very weird. We already had the hairpin legs we wanted for our soon-to-be-built (hopefully) platform bed, so my husband threw together a cheap pine platform bed in an hour, seriously, and we attached the legs to it for now. It actually looks pretty good for unfinished wood. After all was set up and finished, he added center supports underneath to quell my fear of the bed collapsing on our cat. (Thank you, Dear.) I have been sleeping on it for about two weeks and have not awoken with a migraine once. I have only had one headache during the day and I know that was due to some stressful circumstances. I actually wake up feeling better than when I went to bed, something that I haven't been able to say in years. The moment of truth, however, will be in a few months when everything has had time to sag or deteriorate a little. I really don't think we'll have a problem with the bottom latex mattress, but I'm glad I can customize my side of of the bed by removing the memory foam if I need to. If all else fails, we can trash the whole thing and buy that cheap futon for our soon to be made platform bed. Edit- 4/9/13: I've lost all of the comments to this post that included an update, so I'll update here. It's been a year and I'm very satisfied with this latex mattress. I did take the memory foam topper off because it wasn't firm enough for my particular back, although everyone else who napped on the bed loved it. There are no signs of deterioration or sagging. So, I'm really glad we went with this brand. so, its been a couple of months now...how do you like it? I really like the way the frame looks. nice and minimal. I'm so glad you asked! No more waking up with headaches or aching neck/ back. BUT, I like laying on the bottom latex mattress by itself best. It feels supportive beneath my upper back whereas I sink a little into the memory foam topper. I am still using the topper, though, because my husband likes it and it doesnt bother me. It is the best mattress I've owned in my life, but I'm sure a bed similar to hers would be even more comfortable. However, for now, the price of this one is right. And I do sleep like a rock in it. We're going to be making a different frame soon, but I like this one too, for it's thriftiness and simplicity. thanks so much for the reply. My spring mattress is in its death throes and all of the commercial foam beds are sooo stinking expensive. I had read mixed reviews about the manufacturer you used, but perhaps i will give it a shot. 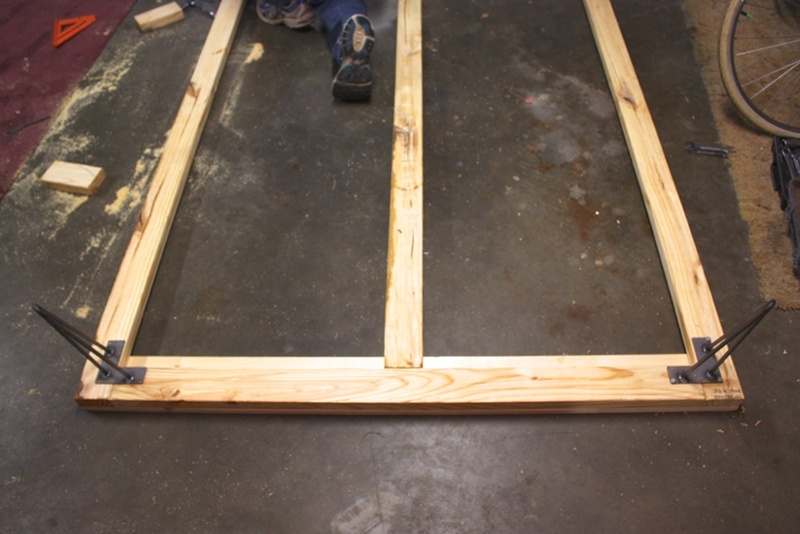 Do you have the plans and a cost estimate for the frame? I have this late 50's headboard that would be perfect with this frame, and I'm wondering how you made it, and if it could be easily replicated in a weekend. Thanks! When we make our new frame, I'll try to post better step by step photos. I hope this helps you and if you make one, I'd love a link to your results. Glad to read a review of the foam factory's latex mattress. Thinking about buying one for our kids. Thank you, Terry! 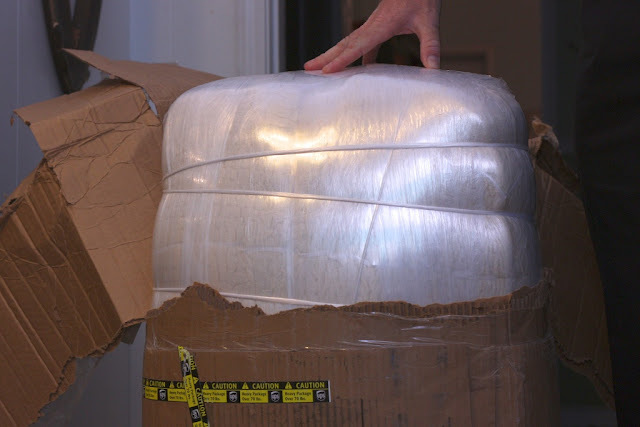 The foam comes covered like an ordinary mattress. So I didn't have to do a thing. By the way, I'm still loving the latex after two years. Did the mattress turn out to be firm even with the memory foam topper? Some people might find it supportive, yet comfortable. My husband loved it, but it was just not firm enough for my back. I have since found that a lot of my neck and back problems are irritated first by foods I eat that cause inflammation, then my neck/ back moves out of place and the firm bed is necessary. When I avoid those inflammatory foods, I have very few migraines or back aches. So it may be that I could sleep on the topper now, but I just haven't tried it. I think it's worth trying the topper, especially if you know someone who would like to have it if you don't like it. But I don't believe soft beds are necessary, or even good for most people, so I'm not much help. What country and state do you live and how is it during the summer? What temp do you set your A/C? Do you think you could sleep on just a 4" topper on plywood? I'm really curious on the heat issues I've read so much about. I like to keep it warm in the house and concerned that it would be too soft due to the heat. Also, I have a electric bed warmer that sits on top of the mattress or topper but underneath the user. So would the heat from that also cause the topper to collapse? So many questions. Thanks for the post and hopefully a reply. What a great point on inflammation causing foods. We just bought a paleo anti-inflammatory cookbook to address both my husband and my issues. We sleep on a sleep number and that has not done hardly anything to help. But your post is helpful as we are looking in to foam for our camper we are restoring. Hey, the camper mattress would be a great way to experiment with a firm mattress! I have, since that previous post, amended the causes of my back/neck issues. Strangely, it is a combo of hormonal imbalance, food, and the way I position my body in sleeping and sitting, etc. I think it's usually a combo problem with people, but I was surprised to see the connection between my hormones and migraines. Best of luck! I'm sorry I haven't repulsed quickly at all! I mentioned yo a long time ago. We keep our house warm- like 75 degrees Fahrenheit year round, with no electric blankets if such. I'd read this type of mattress needs to breathe, that's why we made a slatted base, but I don't know how important that really is. Ours is still going strong and it's been three years. When you say topper, do you mean the more malleable memory foam? I would never sleep comfortably on that, it's too soft. But a four inch latex mattress like ours, noted in the post, would probably be fine. That what our camper mattress is like and it's the absolute best sleep I get! It us also just plywood, no slats. I guess I'm answering this kind of late. I hope you found what you needed!